A team of French and Brazilian researches warns that Chikungunya virus is poised to invade the US. Becoming an epidemic in the Americas according to research published ahead of print in the Journal of Virology. With so many people coming from all over the United States to Rio de Janeiro, Brazil for the FIFA World Cup, next month. The risk of a catastrophic epidemic in America has greatly increased. Brazil has the highest incidence reports of Dengue, a virus that is transmitted by Aedes aegypti and Aedesalbopictus (Asian Tiger mosquito), the same mosquitoes that transmit the Chikungunya virus. Chikungunya is rarely lethal but can cause severe chronic joint pain, which could possibly lead to permanent disability, according to US Centers for Disease Control and Prevention. Because the virus has an incubation period of from two to twelve days, according to the CDC, people carrying the virus often won’t know they even have it. Eight Years ago it spread beyond Africa, where it originated from to Asia, making millions of people ill. Last year in December the first report of Chikungunya transmitted in Americas, on the Caribbean Island of St. Martin. By February 5th the disease had spread to nine additional Caribbean countries, which could possibly be headed our direction. The Asian Tiger Mosquito was introduced to the United States in tire casings imported for recapping. The movement of tire casings has spread to more than 20 states since 1985. The Mosquitoes are found as close to Pennsylvania in New York City. However as of now studies are saying that it is unclear if the Asian Tiger will mosquito will be a significant carrier of disease in the United States. 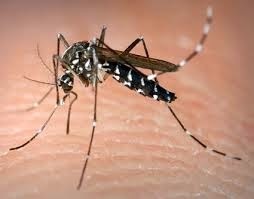 The Asian Tiger Mosquitoes features are distinct says the Examiner.com states in June 26, 2013. It is a small black and white striped color pattern. It has a white stripe down the center of its head and back with white bands on the legs. The wormlike male mosquitoes feed on plant juices and do not bite. Female mosquitoes seek blood to help their eggs to develop. Unlike other mosquito, the Wall Street Journal reported the Asian Tiger Mosquito feeds in the daylight hours not at night. They are attracted to dark clothing, perspiration, carbon dioxide and certain other odors. This mosquito will bite squirrels, dogs, deer and other animals as well as people. Asian tiger mosquitoes spend the winter in egg stage, hatching into larvae when the eggs are covered with water in the spring and summer. The larvae feed on small bits of debris and bacteria in the water. Adult mosquitoes emerge from pupae from water- filled natural and artificial containers like cavities. In as little as 10 to 14 days after the egg hatch during the summer. The Asian tiger mosquito usually does not fly more than about ½ mile from its breeding site. Factors contributing to the spread of Chikungunya is the gradual warming of the Earth resulting from climate change plays a really important role. Specifically the increase in rainfall and an increase in average temperature make perfect conditions for the breeding of the Asian tiger mosquito carrying the virus. According to "New Schientist.com", in December 17, 2013, the ease with which people travel will make it difficult to break the transmission of Chikungunya, warns Herve' Zeller, head of emerging disease at ECDC. The virus can spread if an infected person flies into a new area and is bitten by an Aedes mosquito. Which will then carry the virus to her other meal hosts. To combat the spread of Chikungunya and other mosquito born diseases, like West Nile virus and Yellow Fever. It is recommended that you eliminate the areas where they often breed. Remove any water- filled containers like old tires , roof gutter, food containers and buckets from your yard. Keep mosquitoes from breeding in bird baths, pet water dishes and plastic wading pools by emptying them at least once a week. Neighborhood residents should work together to eliminate breeding sites like abandoned cars, old machinery, drums and other junk vacant lots. This should be done by using mosquito nets, wearing long sleeved shirts and long pants, and applying mosquito repellents. Or should be handled by a professional pest company. Part of the reason this mosquito is called Asian "Tiger" according to Dina Fonseca, an associate professor of entomology at Rutgers University. "Is because it is very aggressive. You can try and swat it all you want, but once it's one you, it doesn't go away." The best defense is a good offence. Make sure you take the steps to protect your yard from these and other disease carrying insects. When you are away from your home make sure you wear repellant and are properly dressed to deter insect bites.